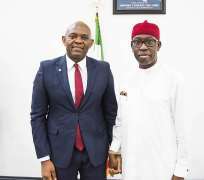 LAGOS, NIGERIA, 5 July 2018 – Today, during a courtesy visit to the Governor of his native Delta State, Tony Elumelu Foundation (TEF) Founder and Chairman of United Bank for Africa (UBA), Tony O. Elumelu, CONpledged N500 million to create an entrepreneurship programme exclusive to indigenes of the state. He made the commitment after presenting 50 beneficiaries of the TEF Entrepreneurship Programme to Governor Ifeanyi Okowa. The TEF Entrepreneurship Programme is Tony Elumelu’s $100 million commitment to identify, train, mentor and fund 10,000 entrepreneurs from across Africa in 10 years. In its 4th year now, the Programme has empowered 50 entrepreneurs from Delta, 251 from the Niger Delta region and 1,862 Nigerians in all.Combined with this new Delta-focused N500 million commitment, Elumelu’s total investment in Nigerian entrepreneurs to N4.4 billion since 2015.